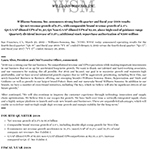 SAN FRANCISCO--(BUSINESS WIRE)--Williams-Sonoma, Inc. (NYSE: WSM) today announced operating results for the fourth fiscal quarter (“Q4 18”) and fiscal year 2018 (“FY 18”) ended February 3, 2019 versus the fourth fiscal quarter (“Q4 17”) and fiscal year 2017 (“FY 17”) ended January 28, 2018. These results include a 53rd week, which added approximately $85 million in net revenues and $0.10 per diluted share to the fourth quarter and the year. These results also include the adoption of ASU No. 2014-09, which pertains to revenue recognition (see Exhibit 2). We are implementing a change to our guidance practice beginning in fiscal 2019. We are only providing annual guidance, which we will update on a quarterly basis, as needed. We believe this approach is better aligned with the long-term view we take in managing the business and our focus on long-term shareholder value creation. Return to Shareholders: quarterly cash dividend of $0.48 per share and incremental share buybacks under our multi-year share repurchase authorization of approximately $710 million. As announced in a separate release today, our Board of Directors authorized a $0.05, or 11.6% increase, in our quarterly cash dividend to $0.48, and increased the amount available for repurchases under our existing stock repurchase program by an additional $500 million. Currently, there is approximately $210 million remaining under our existing stock repurchase program. *We have not provided a reconciliation of non-GAAP guidance measures to the corresponding GAAP measures on a forward-looking basis due to the potential variability and limited visibility of excluded items. Williams-Sonoma, Inc. will host a live conference call today, March 20, 2019, at 2:00 P.M. (PT). The call, hosted by Laura Alber, President and Chief Executive Officer, will be open to the general public via live webcast and can be accessed at http://ir.williams-sonomainc.com/events. A replay of the webcast will be available at http://ir.williams-sonomainc.com/events. This press release includes non-GAAP financial measures. Exhibit 1 provides reconciliations of these non-GAAP financial measures to the most comparable financial measures calculated and presented in accordance with accounting principles generally accepted in the U.S. (“GAAP”). We believe that these non-GAAP financial measures, when reviewed in conjunction with GAAP financial measures, can provide meaningful supplemental information for investors regarding the performance of our business and facilitate a meaningful evaluation of current period performance on a comparable basis with prior periods. Our management uses these non-GAAP financial measures in order to have comparable financial results to analyze changes in our underlying business from quarter to quarter. In addition, certain other items may be excluded from non-GAAP financial measures when the company believes this provides greater clarity to management and investors. These non-GAAP financial measures should be considered as a supplement to, and not as a substitute for or superior to the GAAP financial measures presented in this press release and our financial statements and other publicly filed reports. Non-GAAP measures as presented herein may not be comparable to similarly titled measures used by other companies. This press release contains forward-looking statements that involve risks and uncertainties, as well as assumptions that, if they do not fully materialize or are proven incorrect, could cause our results to differ materially from those expressed or implied by such forward-looking statements. Such forward-looking statements include statements relating to: our ability to continue to improve performance and increase our competitive advantage; our focus on operational excellence; our ability to improve customers’ experience; our optimism about the future; our ability to drive long-term profitable growth; our future financial guidance, including FY 2019 guidance; long-term financial guidance; our stock repurchase program; and our proposed store openings and closures. basis for Q4 2018, and on a 13-week to 13-week basis for Q4 2017.
basis for fiscal 2018, and on a 52-week to 52-week basis for fiscal 2017. **See the Company’s 10-K and 10-Q filings for additional information on segment reporting and the definition of Operating Income/(Expense) and Operating Margin. These tables include non-GAAP revenues, gross profit, SG&A, operating income, operating margin, earnings before income taxes, income taxes, effective tax rate, net earnings and diluted EPS. We believe that these non-GAAP financial measures provide meaningful supplemental information for investors regarding the performance of our business and facilitate a meaningful evaluation of our quarterly actual results on a comparable basis with prior periods. Our management uses these non-GAAP financial measures in order to have comparable financial results to analyze changes in our underlying business from quarter to quarter. These non-GAAP financial measures should be considered as a supplement to, and not as a substitute for, or superior to, financial measures calculated in accordance with GAAP. 1 During Q4 18 and FY18, we incurred approximately $7.2 million and $25.2 million of expense, respectively, primarily associated with acquisition-related compensation expense, amortization of intangible assets, as well as the operations of Outward, Inc. During Q4 17 and FY17, we incurred approximately $6.2 million of Outward-related expense. During Q4 18 and FY18, we incurred approximately $2.5 million and $8.0 million, respectively, of employment-related expense primarily associated with a one-time special equity grant. During Q4 17 and FY 17, we incurred approximately $2.9 million and $8.6 million, respectively, for severance-related reorganization expenses primarily in our corporate functions. 3 During Q4 18 and FY18, we incurred approximately $0.3 million in expenses and $4.1 million tax benefit, respectively, associated with tax legislation changes. In FY17, we incurred $41.5 million of provisional income tax expense associated with tax legislation changes. 4 During Q4 18 and FY18, we incurred approximately $6.8 million and $13.2 million of expense, respectively, primarily associated with store impairment and early lease termination charges. 5 In FY 18, we recorded approximately $1.1 million associated with the adoption of accounting rules related to stock-based compensation. During Q4 17 and FY17, we recorded a tax benefit of approximately $1.7 million and $0.3 million, respectively, associated with the adoption of new accounting rules related to stock-based compensation. We believe ROIC is a useful financial measure for investors in evaluating the efficient and effective use of capital, and is an important component of long-term shareholder return. We define ROIC as non-GAAP net operating profit after tax (NOPAT), divided by our average invested capital. NOPAT is defined as non-GAAP operating income, plus rent expense, less estimated taxes at the company’s effective tax rate. Average invested capital is defined as the two-year average of total assets less current liabilities, plus annual rental expense multiplied by 6, less cash in excess of $200 million. ROIC is not a measure of financial performance under GAAP, and should be considered in addition to, and not as a substitute for other financial measures prepared in accordance with GAAP. Our method of determining ROIC may differ from other companies’ methods and therefore may not be comparable.